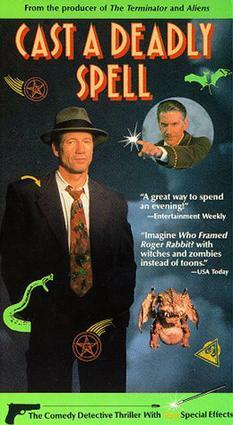 Cast a Deadly Spell (1991) is a comedy horror detective film with Fred Ward, Julianne Moore, David Warner and Clancy Brown. It was directed by Martin Campbell, produced by Gale Anne Hurd, and written by Joseph Dougherty. The original music score was composed by Curt Sobel. Ward stars as 1948 hardboiled private detective H. Philip Lovecraft, in a fictional Los Angeles where magic is real, monsters and mythical beasts stalk the back alleys, zombies are used as cheap labor, and everyone—except Lovecraft—uses magic every day. Yet, cars, telephones and other modern technology also exist in this world. When he takes on a case, he finds himself embroiled in a plot involving magical hitmen, pure damsels, old flames and older evils all connected by a mysterious grimoire. HBO produced a sequel, Witch Hunt. Witch Hunt takes place in the 1950s during the red scare, in which magic is substituted for communism. Dennis Hopper played Lovecraft in place of Fred Ward. Many characters reappear from Cast a Deadly Spell, though some have different backstories. For example, in the first film Lovecraft refuses to use magic on principle, though in Witch Hunt it is stated that he had a bad experience with magic which caused him to stop practicing. ^ a b c d e J. O'Connor, John (September 10, 1991). "Review/Television; A Detective and Sci-Fi In Los Angeles Magic". The New York Times.